Registration Status: Registration for this event has closed. We’re very excited to bring you the first overnight club trip in nearly a decade! The Cape Fear Grady Club will be heading to Beaufort via the Intracoastal Waterway on Friday, September 22 and returning Sunday, September 24. The trip has been planned with lots of free time in mind. Enjoy shopping, make dinner plans with other club members, or enjoy a quiet dinner for two at a local restaurant; the choice is yours! Here’s a video on the trip to beaufort, and you can find our schedule below. We will provide tide info, bridge clearance and opening schedules. If you boat requires an opening, we will not leave you behind. Help you get your Garmin electronics setup to record a track on our way up, making navigation home easier if you decide to run ahead or behind the group. Put together a list of restaurants with menu choices and phone numbers. Click here! Show anyone how to use Uber, a ride sharing app that makes getting around Beaufort by car very easy. Make time and suggest a place to purchase fuel for the run home. Click here! Provide you with a suggested list of items to bring with you. Click here! 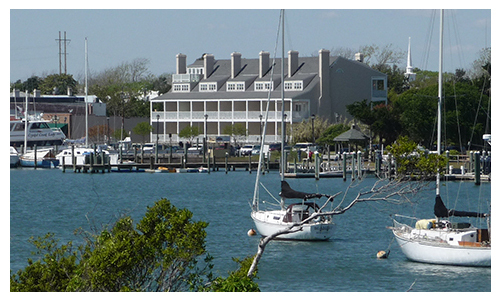 Provide you with plenty of free time to enjoy Beaufort! Answer any of your questions…or try our best! Book all of the dockage, all you need to do is book your hotel room. We will bill you later for the dockage fees. Watch the video to familiarize yourself with how to get to Beaufort. I have blocked a group of rooms for the Cape Fear Grady Club. The price is the same, whether you use the block or book on your own, so you can go either way. If you book service close to the departure, please let me know so that I can be certain your repairs are completed in time. Watch your e-mail or check this page for updates. Invite any friends that want to make the trip, be sure to have them book a hotel room as well. You can register now, and let me know on friends or guests later! Cape Fear Grady Club visits Shackleford Banks from Atlantic Marine on Vimeo.